Im Abonnement enthalten ist ein kostenloser Online-Zugang zum aktuellen und zu allen seit 1992 erschienenen Jahrgängen. Zusätzlich können Abonnenten die kostenlose App 'Quintessence Journals' nutzen. Fachbeiträge auf höchstem Niveau und Farbabbildungen in einer Qualität, die ihresgleichen sucht, haben dieser elegant gestalteten Zeitschrift internationales Renommee und eine treue Leserschaft gesichert. Themen sind die Beziehung zwischen einem gesunden Parodont und präzisen Restaurationen sowie die Implantatintegration auf Grundlage einer umfassenden Behandlungsplanung. Damit vermittelt die Zeitschrift Wissen, das sich in der täglichen Praxis direkt anwenden lässt. • Mit kostenlosem Zugang zur Online-Version recherchieren Abonnenten komfortabel online - auch rückwirkend ab 1992 im Archiv. This case report aims to demonstrate the regenerative potential of particles obtained from a crushed extracted tooth. Following tooth removal, the clean root was ground and the dentin and cementum granules were grafted into a fresh extraction socket for a ridge preservation procedure. After 24 weeks, a successful implant placement was allowed. Tissue healing was evaluated by histologic and radiologic analysis. The volume of the ridge was preserved. Histologically, a dentin-bone complex was reported. New bone formation was evident, with an intimate contact between bone and both dentin/cementum. This novel procedure suggests the use of tooth particles as graft material. The aim of this randomized, prospective study was to compare clinical and radiographic outcomes of microtextured implants with two different collar designs at 1 year postplacement. A total of 69 implants were assessed in 58 patients for site, patient-specific, and clinician-experience variables. Overall implant survival was 94.9%. A statistically significant preservation of crestal bone was observed in the microgrooved-collar group. Narrow implant diameter was associated with a statistically significant increase in crestal bone loss. Collar design and implant diameter may be important in limiting adverse esthetic and bone loss outcomes during initial function. This case report presents a new approach for shock-absorbing carbon-fiber composite frameworks for full-arch implant-supported fixed dental prostheses supporting resin-based and lithium disilicate ceramic crowns. It describes the characteristics of the materials used, the procedures for implementing the framework, and the requirements to achieve the best mechanical and clinical properties. The result is a full-arch prosthesis with masticatory load shockabsorption capacities, chemical bonding between materials, good esthetics, and wear similar to natural enamel. A 24-month follow-up full-arch bimaxillary implantsupported rehabilitation, performed with computer-guided surgery, is described. The aim of this study was to evaluate the factors influencing the volume of healthy maxillary sinuses by means of cone beam computed tomography (CBCT). The sinus volumes in bilateral CBCT images of healthy maxillary sinuses of patients aged 18 years or older were evaluated using dedicated 3D volumetric software. Differences in volume based on gender, age, sinus side, and dental status were analyzed statistically. The study included 174 healthy maxillary sinuses in 87 patients (60 women and 27 men) aged between 18 to 82 years with a mean age of 29.5 years. There were 73 dentate sinuses and 101 partially dentate or edentulous sinuses. Males had significantly larger maxillary sinus volumes compared to females. Subjects below the median age of 24.3 years had a significantly larger sinus volume than older subjects. There was no difference in sinus volume between left and right sides. When partially dentate and edentulous cases were pooled together and compared to dentate cases, there was no difference in sinus volume. Gender and age influence healthy maxillary sinus volume, while sinus side and dental status do not. Neither tooth loss nor increasing age could be correlated with ongoing pneumatization of the maxillary sinus in the present population. Thus, the reported increase of the maxillary sinus volume over life and following extraction of posterior teeth in the upper jaw might be considered a misconception. To prove this hypothesis, prospective studies comparing sinus volumes using standardized time intervals before and after tooth extraction in the posterior maxilla are needed. Systematic reviews showed possible esthetic complications with the use of traditional flap designs after guided bone regeneration (GBR) procedures in the esthetic zone and the aim of this case series was to analyze hard and soft tissue changes over 18 months after these procedures. Healthy subjects requiring tooth extraction and single-implant placement in the anterior maxilla were enrolled in the study. Three months after tooth extraction and ridge preservation, a prosthetic-driven implant was placed. The horizontal bone deficiency was treated with a resorbable bone graft substitute (beta tricalcium phosphate [β-TCP]) and a bioresorbable polylactic acid (PLA) membrane. Primary closure was obtained by a novel coronally advanced flap adapted from mucogingival techniques. Final metal-free implant restorations were delivered 4 months after placement. Clinical measurements, pictures, and radiographs were acquired after delivery of the final restoration (T1) and at the 18-month follow-up (T2). Digital impressions were taken at the time of tooth extraction (T-1) and implant insertion (baseline; T0) and at T2. Marginal bone level changes were assessed by radiographic analysis, while soft tissue changes were evaluated with ExoCad software. Student t test for paired data was used to detect differences between the different time points. Twelve subjects (7 men and 5 women; mean age: 63.7 ± 14 years) completed the study and received 15 implants. All implants healed uneventfully and were clinically osseointegrated and stable, showing no sign of infection. No GBR complications were noted. Statistically significant ridge-width changes were observed after extraction (T-1 vs T0 = -1.72 ± 0.30 mm; P = .00001) and after horizontal GBR (T0 vs T2 = 1.41 ± 0.64 mm; P = .00001). Radiographic bone levels after implant placement remained stable T0 to T2 (0.09 ± 0.08 mm). Periodontal parameters never exceeded physiologic levels. It can be concluded that GBR using a bioresorbable PLA membrane and resorbable β-TCP bone graft in conjunction with a coronally advanced flap is a predictable procedure for horizontal bone augmentation with simultaneous implant placement in the esthetic area. Implant-supported prosthetics are a suitable option for improving partially and totally edentulous patients' oral life quality, especially those patients with a history of periodontitis who experience early tooth loss and therefore require implant therapy. However, long-term clinical studies on dental implants have indicated that patients with periodontitis show more biologic complications and lower survival and success rates compared to periodontally healthy patients. 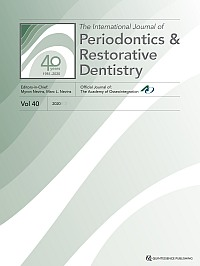 The two clinical reports presented show that patients with aggressive periodontal diseases treated with a supportive periodontal therapy can be successfully rehabilitated with implantsupported double-crown restorations for a follow-up period of over 20 years. Because the main complication of implant-supported prostheses is torque loosening and/or fixation screw fracture, the goal of this study was to evaluate the torque before and after fatigue (screw placement and removal, respectively), single load-to-failure (compression test), and stress concentration of straight and angled abutments. Eighty implants were included in polyurethane cylinders. Half of the implants received straight abutments (group S, n = 40) and the other half received angled abutments (group A, n = 40). The abutments for cemented prostheses were installed with a torque of 20 Ncm. Eighty titanium structures were machined and cemented on the abutments with zinc-phosphate cement. After storage for 24 hours, half of the specimens had their torque loosening evaluated and were then immediately submitted to a compressive test in a universal testing machine (1 mm/minute, 1,000 kgf), while the other half were subjected to cyclic fatigue (200 N at 2 Hz for 2 × 106 cycles at 37°C) as an aging protocol (n = 20 from each group). The aged samples then had their torque loosening measured and were also submitted to the compression test. Representative samples were evaluated by scanning electron microscopy. Two bidimensional models similar to the in vitro specimens were created and analyzed using the finite element method to evaluate the stress concentration. Data from the in vitro tests were submitted to two-way analysis of variance and Tukey test, both with significance at P = .5. The results show that angled abutments are less capable of maintaining the installation torque and are less resistant during the single load-to-failure test. The von Mises stress concentration was higher for group A in the cervical region. The straight abutments have better prognosis than angled abutments and less susceptibility to mechanical failures. A graft's histologic composition depends on the harvesting technique used, and different connective tissue-harvesting procedures have been described in the literature. Some authors suggest the submucosal tissue not be incorporated into the graft because it may interfere with the graft revascularization. In those cases, the de-epithelialized gingival graft (DGG) is obtained with a superficial harvesting technique that leaves the deep portion of the submucosa and the periosteum excluded from the graft. The aim of this case series was to histologically and histomorphometrically evaluate the tissue obtained with this technique. The findings demonstrated that the DGG was mainly composed of connective tissue, and adipose tissue was in minimal proportions. However, epithelium was found in all of the samples. The aim of the present study was to consider the long-term midfacial mucosal outcome around final prosthetic restorations on dental implants placed and loaded immediately after tooth extractions. A total of 42 patients requiring tooth extractions were recruited, and 142 teeth were extracted. Based on the amount of keratinized mucosa (KM), implants were categorized into group A (KM ≥ 2 mm; n = 61) or group B (KM < 2 mm; n = 62). In both groups, all patients received temporary prosthetic restorations immediately after the surgical procedure. Baseline levels were measured at placement of the final prosthetic restoration and patients were followed for 8 years. After the 8-year follow-up, a survival rate of 98.37% was reported. Two implants were lost due to peri-implantitis after 6 and 7 years of function, respectively. Peri-implantitis occurred at 9 implants (3 from group A and 6 from group B) in 8 patients (7.32%). At the 8-year followup for group A, an increase in midfacial tissue level of 0.14 ± 0.13 mm (screwed restorations) and 0.16 ± 0.09 mm (cemented restorations) was measured. For group B, a decrease in midfacial tissue level of 0.15 ± 0.09 mm (screwed restorations) and 0.17 ± 0.12 mm (cemented restorations) was reported. Statistically significant differences between groups were measured at 2, 5, and 8 years of follow-up (P < .01). The results demonstrated that the presence of KM is significantly associated with less mucosal inflammation and less gingival recession, regardless of the type of prosthetic restoration (screwed vs cemented). The objective of this preclinical study was to investigate the effect of biologic aging of implants on osseointegration in the canine. According to multiple comparisons, there was a significant difference in bone-to-implant contact (BIC) between control implants placed 6 months after manufacture and 2-week-old implants (P = .016), and between control and newly prepared implants with acid-etching (P = .019). However, there was no significant difference in BIC between newly prepared implants with acid-etching and 2-week-old implants. In all groups, BIC at 12 weeks was significantly higher than at week 4 (P < .05). There were no significant differences in bone volume (BV) regardless of area and time. Biologic aging of implants might affect osseointegration in the bone marrow zone at 4 weeks of healing. Although implant aging did not greatly affect BIC and BV at 12 weeks of healing in this study, further research is required to determine an appropriate period of biologic aging of implants that yields significant clinical effects. An undesirable injury of adjacent teeth is one of many accidents that may occur during implant placement. Limited surgical access in a noncooperative patient can induce apical root transection. When endodontic pathosis is identified, root canal treatment is often initiated to prevent implant microbial contamination. This case report demonstrates the successful resolution of implant endodontitis by endodontic intervention without any surgical treatment in a patient presenting a moderate mental disorder. The present case series evaluated three-dimensional volumetric bone tissue changes and new bone formation in severely resorbed extraction sockets augmented with Bio-Oss collagen and a covering collagen membrane in nine chronic periodontitis patients. Healing was by secondary intention. After 12 months of healing, the augmentation procedure appeared not only to compensate for bone remodeling but also appeared to repair a significant portion of the buccal wall. The mineralized tissue filled the 91.49% ± 6.77% of the maximum volume for regeneration. Overall, a mean of 49.6% new bone, 27.1% residual graft material, and 23.3% connective tissue were detected. This report describes a minimally invasive surgical approach using the vestibular incision subperiosteal tunnel access and a suture called the subperiosteal sling (SPS) to stabilize the connective tissue graft (CTG) for periodontal plastic surgery. The SPS suture engages only the CTG and stabilizes the CTG against the tooth independent of the overlying tissue, which minimizes the risk of graft mobility caused by muscle movement. This study investigated the level of magnetic energy around implants possessing a static magnetic field (SMF) and assessed the in vivo influence of SMF on bone regeneration. Implants possessing a sintered neodymium magnet internally were placed in a rabbit femur. An implant without SMF was placed as control. After 12 weeks of healing in vivo, the bone samples were subjected to histologic/histomorphometric evaluation. The bone-toimplant contact for the test group and the control group were 32.4 ± 13.6% and 17.1 ± 4.5%, respectively, and the differences were statistically significant (P < .05). The results suggested that the SMF promoted new bone apposition. Gingival thickness plays a pivotal role in both the etiology and treatment of gingival recessions. When treating gingival recessions by different periodontal plastic surgery techniques, a relationship has been reported between the thickness of the tissue used to cover the exposed root surface and the recession reduction. This case series illustrates a technique making use of a very thick graft, which consists of the entire thickness of the palate in its central part, from the periosteum to the epithelium, to obtain complete root coverage with high predictability. At 12 months, the treatment resulted in 100.22% ± 6.95% root coverage, and 14 of the 15 treated teeth (93.3%) were completely covered. El Hajj, Fady A. / Abou-Arraj, Ramzi V. / Reddy, Michael S. / Majzoub, Zeina A. K.. The objectives of this study were to clinically and histologically assess the capacity of bilaminar subepithelial connective tissue grafts (SCTGs) alone or in combination with gingivoplasty (Gv) to increase the keratinized gingiva width (KGW) in contralateral mandibular sites lacking KG (10 patients, 42 sites). The effects of Gv timing (1 vs 2 months) and technique (blade vs laser) were also evaluated. SCTGs alone resulted in mean KGW increase of 0.1 to 0.7 mm. Laser-Gv significantly increased KGW by an additional 1.9 mm at 4 months postabrasion as opposed to 0.9 mm achieved with blade-Gv. Histologically, laser-treated sites displayed parakeratinization with more pronounced rete pegs than observed in blade-abraded sites. Froum, Stuart J. / González de la Torre, Eduardo / Rosen, Paul S.
Peri-implant mucositis has been defined as a reversible inflammatory reaction in the soft tissues around a functioning implant with no bone loss. This paper reviews the prevalence, etiology, risk indicators, prevention, and treatment of mucositis. Relying on the literature concerning mucositis, the bacterial etiology is discussed as well as the varying ranges of prevalence, reported to be from 20% to 80% of subjects (13% to 62% of implants) after a minimum of 5 years of implant function. A discussion of the definition of mucositis questions the assumption of it being completely reversible following treatment and challenges the concept of mucositis "transfer" (conversion) to peri-implantitis. The objective of this study was to evaluate the effect of leukocyte platelet-rich fibrin (L-PRF) on immediate implant stability and recovery. A total of 60 immediate implants were evaluated. After the extraction, using split-mouth design, test sockets were coated with L-PRF (L-PRF+) and control sockets were not (L-PRF−). All the implants were followed for 12 months. Results showed a statistically significant difference between the stability of L-PRF+ and L-PRF− implants at 1 week and at 1 month. Mean marginal bone resorption was higher in the control group at 1 year. Postoperative complications may occur during the healing of palatal donor sites due to disturbed blood circulation of palatal tissues. Therefore in this study, blood flow was measured by Laser Speckle Contrast Imaging (LSCI) in seven patients after connective-tissue harvesting. The slope in blood-flow elevation within the first 3 days as well as time needed for maximum reperfusion were calculated. Each surgical site was assessed by clinical examination on day 3. In donor sites with secondary-intention wound healing, postoperative blood flow was elevated with significant delay compared to the surrounding tissues and to the primarily healed wound. Reperfusion time and healing score were strongly correlated (r = 0.87, P < .001), as were the slope and clinical rank (r = -0.85, P < .001). LSCI proved to be an objective method to assess individual wound-healing time and to predict the quality of wound healing.